Konstantinos "Kostis" Stephanopoulos (Greek: Κωνσταντίνος (Κωστής) Στεφανόπουλος, 15 August 1926 – 20 Νovember 2016) was a Greek conservative politician who served two consecutive terms as the President of Greece, from 1995 to 2005. Stephanopoulos was born in Patras on 15 August 1926 to the lawyer and subsequent People's Party Member of Parliament Dimitrios Stephanopoulos [el], and Vrisiis Philopoulou. After attending the Saint Andrew school of Patras, he studied law at Athens University. He practiced law from 1954 until 1974 as a member of the Patras Bar Association. He first stood for election in 1958, with the National Radical Union and was elected for the first time as MP for Achaea Prefecture in 1964. He was re-elected for the same constituency for New Democracy (ND) in 1974, 1977, 1981 and 1985. He served as ND parliamentary secretary and parliamentary spokesman from 1981 to 1985. In 1974, Stephanopoulos was appointed Deputy Minister of Commerce in the National Unity government of Constantine Karamanlis. For the next seven years he served in a number of ministerial posts in New Democracy governments; Minister for the Interior from November 1974 to September 1976; Minister for Social Services from September 1976 to November 1977 and Minister for the Presidency from 1977 to 1981. In August 1985 he resigned from ND and on 6 September formed Democratic Renewal (DIANA). He was elected Member of Parliament for Athens in the 1989 elections while continuing as the leader of DIANA, until it disbanded in June 1994. On 8 March 1995, after being nominated by the conservative Political Spring party and supported by the ruling Panhellenic Socialist Movement (PASOK), he was elected President of Greece, winning the election on a third ballot of MPs with 181 votes. He was the fifth person to hold the post since the restoration of democratic rule in 1974. He was re-elected on 8 February 2000 on the first ballot, after receiving the support of 269 of the 298 MPs present. He remained in office until 2 March 2005, when he was succeeded by Karolos Papoulias. As a President he was known for his low-key profile, unifying approach to current and international affairs, and gentlemanly behaviour. During his presidency, he was consistently the most popular public figure in Greece. As head of state of the host country, he officially declared the 2004 Athens Olympics open, on 13 August 2004. Stephanopoulos died at 23:18 in Henry Dunant Hospital, Athens, on 20 November 2016 at the age of 90. He had been hospitalised three days earlier, suffering from fever and severe respiratory difficulty, which later emerged as pneumonia. Stephanopoulos was married for 29 years to Tzeni Stounopoulou, who died in 1988. The couple had three children. 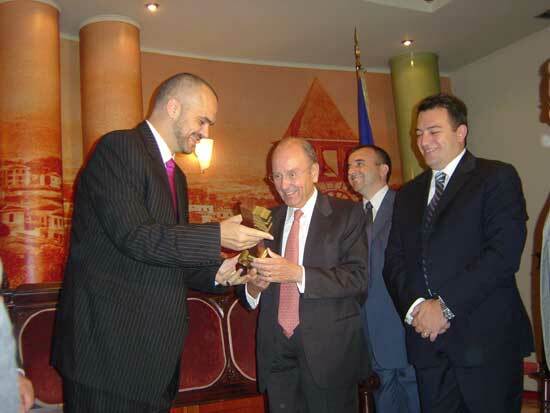 Stephanopoulos received many honorary awards and the highest decorations of foreign countries. He was an honorary citizen of many Greek towns. Slovenia : Golden Order of Freedom (1999). Albania : Received a copy of the key of the city of Tirana on the occasion of his state visit to Albania. ^ a b c d e f g h "Πέθανε ο πρώην Πρόεδρος της Δημοκρατίας Κωστής Στεφανόπουλος". in.gr. 20 November 2016. Retrieved 21 November 2016. ^ a b "Κοινοβουλευτική Θητεία Βουλευτών Από Τη Μεταπολίτευση Ως Σήμερα". www.parliament.gr. Retrieved 2016-11-20. ^ "Former Greek President Constantine Stephanopoulos dies at 90". Washington Post. 20 November 2016. Retrieved 21 November 2016. ^ "ΑΠΕ-ΜΠΕ: Έφυγε από τη ζωή ο πρώην Πρόεδρος της Δημοκρατίας Κωστής Στεφανόπουλος". www.amna.gr. Retrieved 2016-11-20. ^ "Seznam vseh odlikovancev od leta 1992 do decembra 2012" (in Slovenian). President of the Republic of Slovenia. Retrieved 2016-11-21.